The failings of the flesh are clearly more powerful than the refrain of religion, or so Ang Lee’s movie “The Life of Pi” appears to suggest. A story within a story, the movie is definitely a must see, but I felt the movie, despite some brilliant acting by newbie Suraj Sharma playing the young Pi, did not hold up to Martel’s award winning novel, "The Life of Pi.". Ang Lee’s captures the drama on the high seas with the elan of a maestro. It’s almost as if the emotional and moral storm that rages within Pi, the protagonist, manifests itself in the angry waves that lash and virtually tear apart the boat that Pi is forced to share with a hyena, an orangutan, a wounded Zebra, and Richard Parker, the Bengal Tiger, in the aftermath of a shipwreck. This story within a story could pass off as a simplistic fable for children to watch on a 3D screen; however, it could as well embed itself permanently in the viewer’s mind as a story that defies closure. What did Pi do on that boat, and what was done to him will have to be decided by the viewer. Not a wonder then, Yann Martel, the 2001 Man Booker Prize winning author of the novel "Life of Pi" also leaves it to the readers to decide what they wanted to have happened to Pi on that boat and whether "Richard Parker is more than just a tiger... Some people could say it’s Pi himself. Some people can, in a sense, say it’s like God -- we're afraid of God, but he brings comfort and he keeps us going, which is what the tiger Richard Parker did." happy new year dear I Me My! Best wishes to you, too. As to me, I think I first see it on the telly. What a strange subject though a little bit related to "the old man and the sea" from Hemingway. Generally, the book is better than the movie but right now I am hitting on the contrary, "The Murdoch Mysteries", a Canadian show set in 1890 in Toronto. I appreciated it so much I bought two volumes at Amazon. Well, it reads like driving on four flat tires. Had to come back on my quite unfriendly comments regarding Maureen Jennings' books. They don't have very much to do with the characters on the TV show but the books stand in their own light. Those two I know now ("Poor Tom is cold" and "Under the dragons tail")draw a vivid picture of life in Toronto around 1895, especially the life of people who work hard to make a living (or not or only barely). Terrifying in fact. Right now I bought two more volumes and wanted to put this right. Life of Pi wins two Oscars already! For cinematography and visual effects! Another Oscar for Life of Pi for Original score! 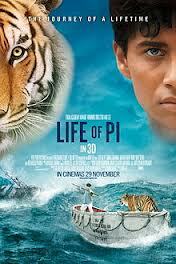 Fourth Oscar for best director for Life of Pi!